This past weekend, Crimson Storm football played their final game of the season. The team ended the season winning two of the last three games, bringing their overall record to 3-8. 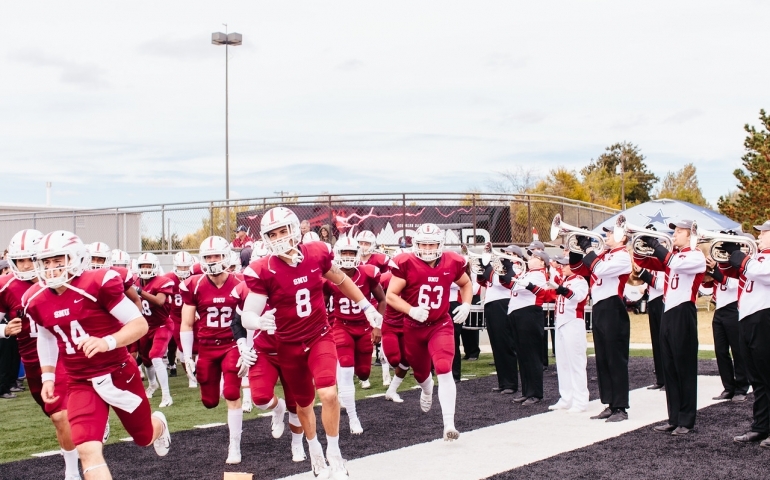 Even though the season did not go as planned, the team continually showed signs of growth and improvement, bringing hope and anticipation for the future of SNU football. With every passing season, we are forced to say goodbye to senior players. This year is no different, as we must send off 12 young men who have represented SNU with dignity and class throughout their collegiate careers. They have continuously striven to become the best at their sport through their constant hard work, dedication and discipline. Like other seniors before them, they led by example, paving the way forward for the younger players. These seniors were here when Head Coach Andy Lambert took the reins for the 2016 season. When asked about this senior class, Lambert responded, “They’ve been fantastic. It’s been a joy to coach them. They’re highly successful academically, and they’ve all been such a strong part of the last three years. Any new program must have a strong foundation to build upon and this program is no different. Defensive Coordinator, Coach Kyle Schenk stated, “They’ve shown great perseverance, resilience and determination. They’ve been through a lot and have stuck it out. The foundation of the program has been built on their shoulders. Even though the season did not go as well as many had hoped this year, this entire team still gave their all. This team and these seniors will always be part of the strong foundation being built by Coach Lambert and his staff. The work being done now will allow the growth of future teams to turn this program into a championship contender in the Great American Conference. This year’s Crimson Storm senior class consisted of Carlos Anguiano, Marin Biletic, Reece Carlson, Lakeem Christmas, Daniel Flynn, Derrick Gillis, Jacoby Hicks, Trey Hills, Breyon Jackson, Daniel Ramos, Myles Roll, and Jake Spady. The SNU family is appreciative for how you have represented this university throughout your college career. Thank you for dedicating your collegiate football career to SNU and building this football program. It has been a pleasure getting to watch all of you play football and be a tremendous part of the Crimson Storm Athletics. Best of luck to all of you in your future endeavors. Bolts Up!